In 2017, the Georgia Museum of Art received a gift of a significant group of paintings and works on paper from C. Herman and Mary Virginia Terry. Mrs. Terry and her late husband have generously supported many endeavors across the University of Georgia for decades, including the Terry College of Business, which bears their name. Together, they collected these works of French and American art with a discriminating eye to hang in their home. 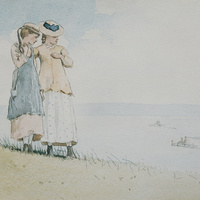 The resulting group features delicate watercolors by Winslow Homer, John Singer Sargent and Andrew Wyeth, a pastel by Childe Hassam and oils by John Twachtman, Maurice Prendergast and John Leslie Breck, among others. The intimate exhibition features all 14 works, which greatly increase the museum's holdings by some of these major artists.